Cloud based Wireless sensor network (WSN) technology is used in real-time applications as users can access the data from sensor nodes through cloud at any time and at any place. This provides various features like easy data storage, maintenance, availability, sharing etc. Sometimes the data which is requested by users may not be received on time as multiple users can access data from cloud at same time or may be lost during transmission. Therefore this results an unreliable and inefficient approach. In this paper, we proposed a protocol to increase reliability of cloud based WSN technology. MEAL Based Routing in WSN, Patalia, Tejas, Tada, Naren, Patel, Chirag, Satapathy, Chandra Suresh, Das, Swagatam Proceedings of First International Conference on Information and Communication Technology for Intelligent Systems: Volume 2 2016 Springer International Publishing Cham 978-3-319-30927-9 Patalia 2016 10.1007/978-3-319-30927-9_11 http://dx.doi.org/10.1007/978-3-319-30927-9_11 109–114. B. Kantarci and H. T. Mouftah, “Trustworthy Sensing for Public Safety in Cloud-Centric Internet of Things,” in IEEE Internet of Things Journal, vol. 1, no. 4, pp. 360–368, Aug. 2014. doi: 10.1109/JIOT.2014.2337886. D. H. Phan, J. Suzuki, S. Omura, K. Oba and A. Vasilakos, “Multiobjective Communication Optimization for Cloud-Integrated Body Sensor Networks,” Cluster, Cloud and Grid Computing (CCGrid), 2014 14th IEEE/ACM International Symposium on, Chicago, IL, 2014, pp. 685–693. doi: 10.1109/CCGrid.2014.48. 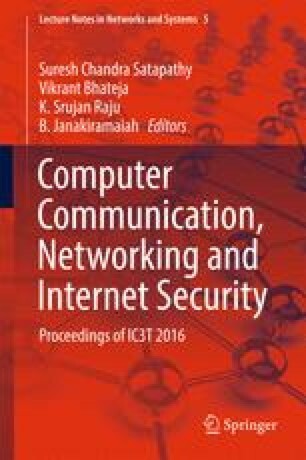 C. Zhu, H. Nicanfar, V. C. M. Leung and L. T. Yang, “An Authenticated Trust and Reputation Calculation and Management System for Cloud and Sensor Networks Integration,” in IEEE Transactions on Information Forensics and Security, vol. 10, no. 1, pp. 118–131, Jan. 2015. doi: 10.1109/TIFS.2014.2364679. Md. Golam Rabiul Alam, Eung Jun Cho, Eui-Nam Huh, and Choong Seon Hong. 2014. Cloud based mental state monitoring system for suicide risk reconnaissance using wearable bio-sensors. In Proceedings of the 8th International Conference on Ubiquitous Information Management and Communication (ICUIMC ‘14). ACM, New York, NY, USA, Article 56, 6 pages. DOI:http://dx.doi.org/10.1145/2557977.2558020. S. Chatterjee and S. Misra, “Dynamic and adaptive data caching mechanism for virtualization within sensor-cloud,” 2014 IEEE International Conference on Advanced Networks and Telecommunications Systems (ANTS), New Delhi, 2014, pp. 1–6. doi: 10.1109/ANTS.2014.7057243. Jun-bin Liang, Ning-jiang Chen and Min-min Yu, “A cloud model based multi-dimension QoS evaluation mechanism for Wireless Sensor Networks,” Computer Science & Education, 2009. ICCSE ‘09. 4th International Conference on, Nanning, 2009, pp. 348–352. doi: 10.1109/ICCSE.2009.5228429. C. Zhu, Z. Sheng, V. C. M. Leung, L. Shu and L. T. Yang, “Toward Offering More Useful Data Reliably to Mobile Cloud From Wireless Sensor Network,” in IEEE Transactions on Emerging Topics in Computing, vol. 3, no. 1, pp. 84–94, March 2015. doi: 10.1109/TETC.2014.2364921.